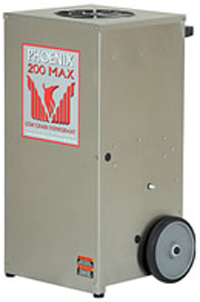 The Phoenix 200 MAX LGR Dehumidifier replaces the original Phoenix 200, which was the first dehumidifier to be described as a "Low Grain Refrigerant" or LGR dehumidifier. This successor model to the original 200 combines its outstanding grain depression performance with additional features to make restoration projects more manageable and to lower costs. In common with all Phoenix restoration dehumidifiers this unit offers superior air filtration which protects the unit from damage by air-borne particles and extends its effective working life. The Phoenix 200 Max Dehumidifier is designed for heavy duty operations with the needs of the water damage restoration professional in mind. It is a powerful dehumidifier which can extract 128 pints of water per day at 80°F and 60% relative humidity (AHAM) and as much as 240 pints per day at saturation. The unit is suitable for medium to large scale water damage restoration projects and a range of commercial and industrial applications where its special qualities may be required. The 200 Max follows in the foot steps of the Phoenix 200 using Low Grain Refrigerant (LGR) Technology to achieve lower specific humidity levels than a conventional refrigerant dehumidifier. This speeds up the drying process and is a particular advantage where deep drying is required. LGR dehumidifiers are not only more effective but also more energy efficient than conventional units and the 200 Max draws only 7.4 amps in operation. The Phoenix 200 Max Dehumidifier provides multiple ducting options allowing the operator to duct both the intake air and the filtered and dehumidified supply air via a 10-inch lay-flat duct and a 12-inch flex duct. This provides users with the opportunity to combine the dehumidifier with a HEPA air scrubber, an air conditioner or a desiccant dehumidifier according to the particular requirements of any drying job. The 200 MAX also provides superior air filtration by means of a 65 % MERV-11 air filter fitted as standard. This not only protects the unit from damage but also improves air quality throughout the drying area. MERV-6 and MERV-8 may also be used and an option is available to upgrade to a 95% MERV-14 filter if required. The 200 Max will be effective in low temperature operation due to an effective auto-defrost system. This system allows the unit to dehumidify in ambient temperatures as low as 33°F. The 200 Max will function equally well right through the temperature operating range, to a maximum ambient temperature of 105°F. The Phoenix 200 Max Dehumidifier is configured for continuous drainage which, in conjunction with its auto-restart on power failure feature allows the unit to operate unattended if required. Drainage is simplified by the incorporation within the unit of a powerful condensate pump with a 20 foot lift capacity. A 30 foot vinyl hose is also supplied for disposal of the condensate. A switch on the control panel allows manual purging of the internal reservoir prior to removing the unit to another location. The 200 Max is a compact dehumidifier in its class. The exterior dimensions include a foot-print of 24.25 x 21.375 inches while its height is 40 inches. A manoevring handle and two sturdy wheels on a rear-mounted axle make this unit relatively easy for a single operative to move on site and its weight of 131lb makes it easily portable even in smaller vehicles. The Phoenix 200 Max Dehumidifier is a durable unit with robust components, a stainless steel housing and a shock absorbing axle. Phoenix have such confidence in their product that the unit qualifies for a five year warranty of which the first year covers parts and labor and the remaining four years the refrigeration parts.